I made blueberry muffins yesterday in the hopes of posting them here. I have made them many times and I think they are “blog worthy”. However, they were not pretty. Not even remotely good looking. They were the ugly stepsister of muffins. I tried really hard to get a decent picture to post. Nope, no amount of fiddling, prodding, propping or stying could make them look pretty. So we abandoned that idea and just ate them. Thankfully, dinner was a huge success. Herbed Chicken which we make often, this time with a fresh pesto parsley. We had a plethora of parsley accumulating in the refrigerator. You see, I have been helping out in my friends garden (farm really it’s so big), and every time I prepare to leave this huge patch of parsley speaks to me, so I snip just a few sprigs. Well after 2 weeks of snipping and not a lot of usage, you end up with tons of parsley. Add a clove of garlic, some olive oil, few nuts (I felt like almonds this time), and a squeeze of lemon, and you have a nice little pesto. Easy really, and makes an every day dish just a little more special. Place chicken breasts in large shallow bowl, drizzle with olive oil and lemon. Liberally sprinkle with parsley and chives. Add some salt and pepper. Place on BBQ (or inside on grill pan over stovetop) and grill turning often for 12-18 minutes, or until an internal temperature of 160f is reached. Remove from heat and tent loosely with foil and let rest 5 mins. Add parsley, chives, almonds, garlic, juice and zest of lemon and salt and pepper and red pepper flakes if using to blender or food processor. Pulse a few times, then with machine running slowly add olive oil until you reach a very loose paste consistency. 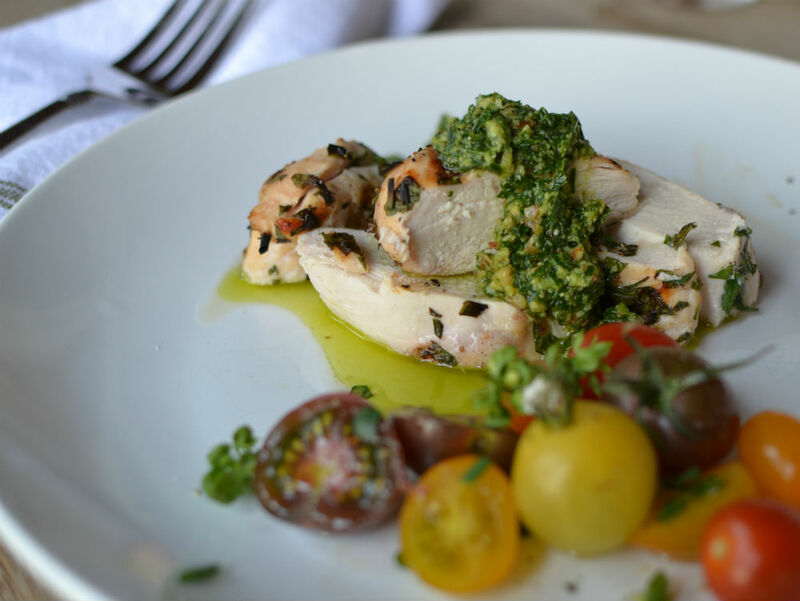 Slice chicken and spoon pesto over to serve. Pam, tried the ribs on Friday night – delish!! And now we will be trying the herbed chicken. This looks and sounds delicious. A must try! Hope you are having a fabulous summer honey! !